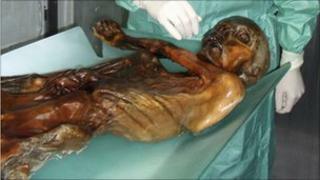 Oetzi, the 5,000 year old "Iceman" found in the Italian Alps, may have been ceremonially buried, archaeologists say. An autopsy showed that Oetzi had been murdered, dying of an arrow wound. While this is not disputed, a new study suggests that months after his death, Oetzi's corpse was carried to the high mountain pass where it was found. The discovery site therefore may not be a murder scene after all, but a burial ground. The new study, led by Professor Luca Bondioli of the National Museum of Prehistory and Ethnology in Rome and his US-Italian team, is published in the journal Antiquity. Oetzi was discovered on the alpine border between Italy and Austria in 1991. Although thought at first to be the corpse of a modern climber, scientists later proved that the mummified body was more than 5,000 years old. An autopsy in 2001 further showed that he had been killed by an arrow wound to the shoulder. In the new study, researchers produced a detailed map of where the corpse and artefacts were found. Based on guesses about how the artefacts had dispersed down slope over time, they inferred that the body had originated on a rock platform nearby. They argued that this was a later burial site, and not the original scene of his murder. This "burial theory" may explain some perplexing facts about Oetzi. For example, analysis suggests he died in the spring because the pollen of plants that bloom at that time of year is found in his gut. However, pollen within the ice suggests that the corpse was deposited in the late summer. Professor Bondioli and his team say that these facts makes most sense if the body was deliberately carried to its site of discovery many months after death. Professor Bondioli elaborated: "Oetzi must have been a very important person to be taken to this high mountain pass for burial. Perhaps he was some sort of a chieftain." However, Professor Frank Ruehli of the University of Zurich, the medical doctor who performed the original autopsy, is not totally convinced by the burial theory. He remarked: "The left arm of the corpse is in a weird position. This must have happened at the time of death." "If Oetzi was a chieftain, why did his people not move the twisted arm into a more natural position?" he told BBC News. "This would be expected in the burial of an important person". Also somewhat sceptical is Dr Wolfgang Muller of Royal Holloway University of London. He studied the chemistry of Oetzi's teeth and bones to track his migration route through the Alps. "It's an interesting new interpretation but it's not bullet proof," he said. "However, if Oetzi was buried they must have carried the body a long way because the nearby villages would have been at a low altitude." While much remains to be learned about the enigmatic Iceman - as the mummified corpse has been dubbed - one thing is certain: This famous mummy will remain the subject of intense speculation and new research for decades to come.